I am so fascinated by the sky and clouds. I love photos of clouds. I love a nice clear blue sky. Raisin’s fascination is with space. He loves reading about the planets and the moon. One day, a little while ago, Raisin was asking about the sky. He wondered when the sky ended and space began. 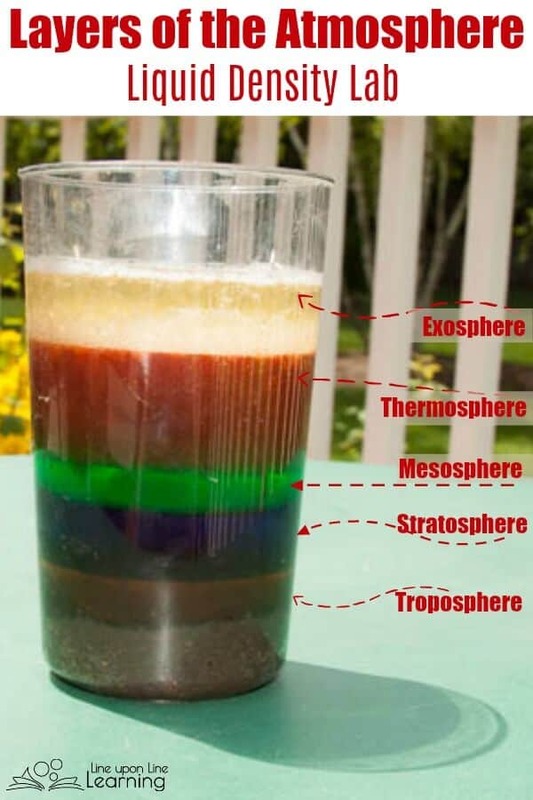 I did not know, so we began a project for learning the layers of the atmosphere! We learned about the atmosphere layers by doing an interactive lab with kitchen materials (honey, corn syrup, dish soap, water, and vegetable oil). 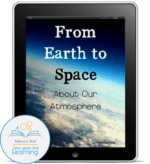 In the process, I wrote a simple ebook with atmospheric layers diagram to help us understand, and we culminated our learning with a hands-on atmosphere lab. 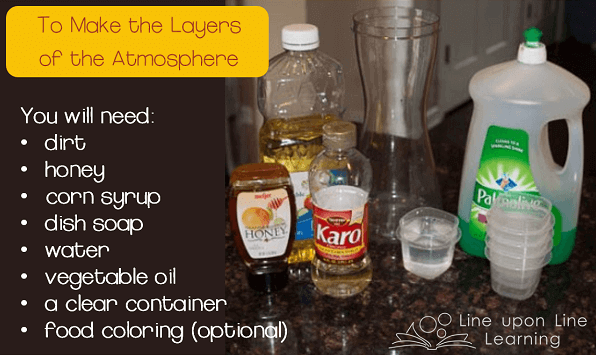 For this lab, we used the things I have in my kitchen to recreate the different layers of the atmosphere. 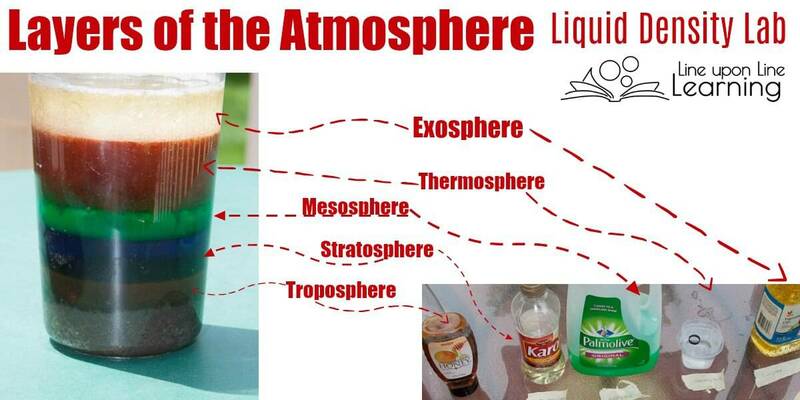 Here’s what we used to create our atmosphere layers model. After we assembled it all together, it was pretty easy to put together. I choose to add food coloring to a few of the layers. You must add the items into a clear (so you can see it) cup in the order below. We ended up using a slightly shaded cup, so it is more difficult to see the layers, as it all is rather dark. Note: I found Steve Spangler’s density chart to be very helpful as I decided which items to use for each layer. 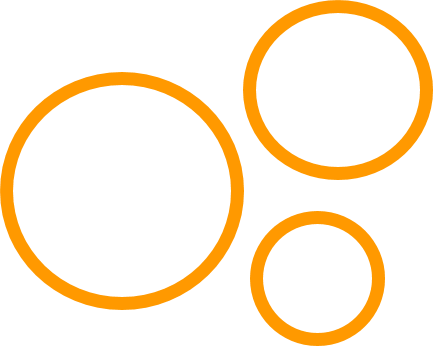 You could use different liquids if you desire, but make sure the densities of the liquids go from heaviest (or most dense) on the bottom to lightest (least dense) on the top. Dirt = the earth. Make sure you pack this down in the cup so dirt won’t float around in the liquids. 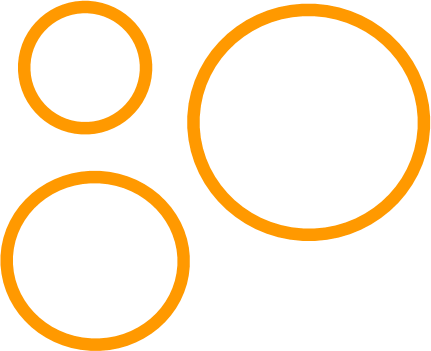 Honey = Troposphere (orange). This is were we live and where clouds and weather are. Corn syrup = Stratosphere (food coloring added to make it blue). This is where airplanes fly, just above the clouds. We added a small eraser to ours that looked like an airplane; although it did float between the honey and the corn syrup, it was too difficult to see in our pictures due to the deep blue from the food coloring. Dish soap = Mesosphere (green). Water = Thermosphere (food coloring added to make it red). Many of the earth’s satellites are in this level. We added a small rubber band to represent a satellite. Again, you can’t see it very well. Vegetable Oil = Exosphere (light/clear yellow). This is the level of the atmosphere that is very thin and blends in to space. It seemed appropriate that the vegetable oil left bubbles on top; there is very little to distinguish between the exosphere and space. This ended up being quite a fun lab. We were all dirty and sticky by the end, but Raisin and I sure had fun learning about the Atmospheric layers! If you try this, I’d love to know how it goes! Do you want to learn about the atmosphere layers too? 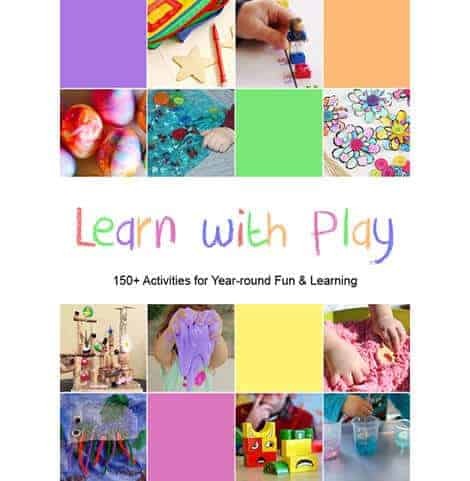 You can get my ebook from my Shop (or on TPT and TN). 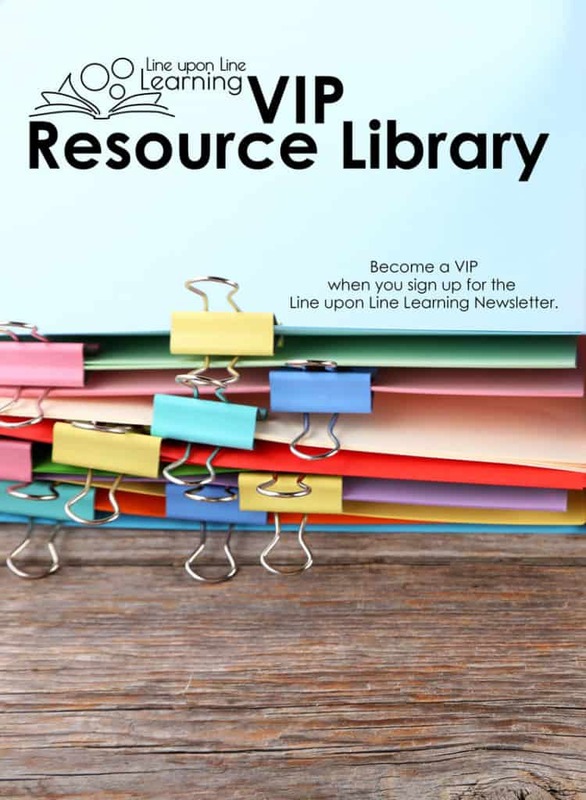 Or, pick up my layers of the atmosphere diagram for free when you sign up to become a Line upon Line Learning VIP. 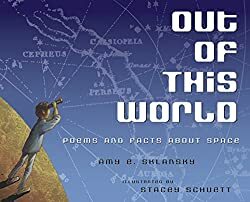 Out of This World by Amy Salansky and illustrated by Stacey Schuett is a picture book with simple illustrated poems about space and our relation to it. I love how the illustrations of space, and the facts given for each page, tie right in to the poems. The more you know about space, the more the book is delightful! 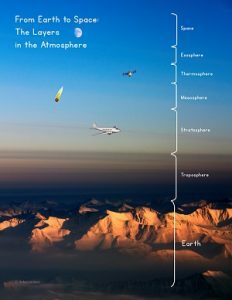 There is even a page about the atmosphere, which is why this picture book would be a great tie in for this atmosphere lab. Random question – if I topped the container these liquids are in and shook it up, I assume all layers would move back into place or would some of them mix and the model be messed up? I tried it and did stir it after we saw all the layers. The dish soap and water mixed together as you would suppose, but everything else separated back out. Tried this with my 5th grade science class today. They were so amazed that the layers separated out! It was a lot of fun! 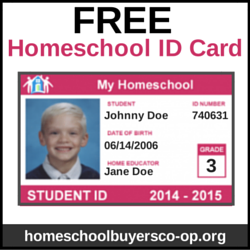 And nice and easy with things I already had in the house! Thank you! 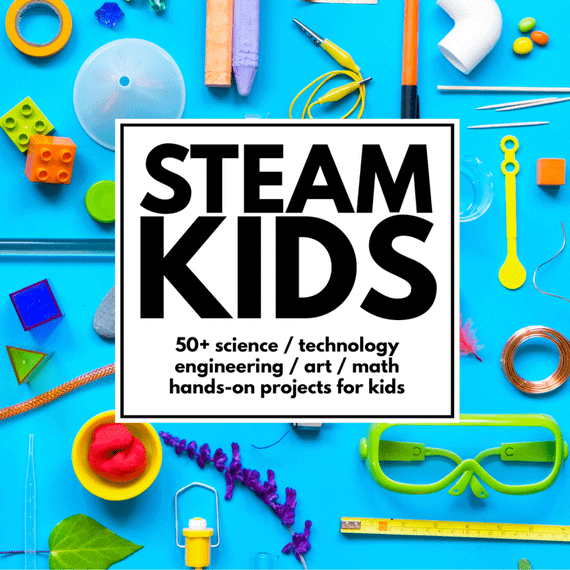 We conducted this experiment and my children loved seeing the liquids separate – went really well with our weather calendar and books we are making.